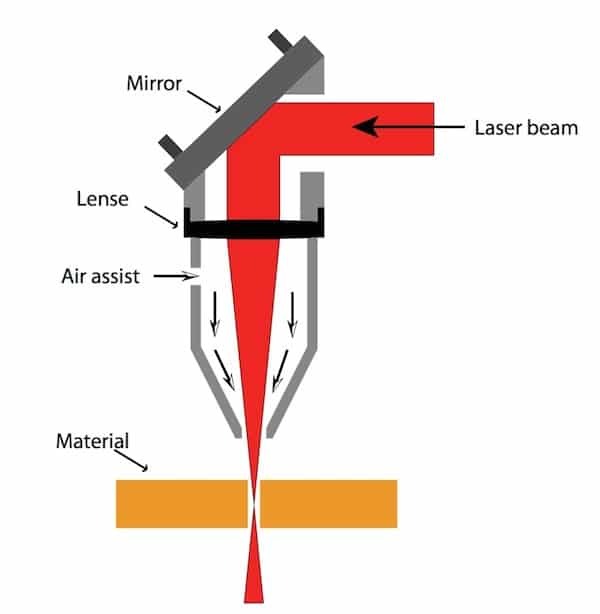 CO2 laser cutting uses a focus lens to gather CO2 laser beams on the material surface for melting them. At the same time, the coaxial compressed gas blows away the materials melt, making laser beams and materials do relative motions along a certain path and forming a certain shape of cutting seam. Since the 1970s, as the CO2 laser and the numerical control technology development, they have become an advanced plates cutting method. stamping for mass complex components and vibration cutting for the single piece. After the 70s, in order to improve the incision quality of flame cutting, the oxyethane precise flame cutting and plasma cutting were popularized. In order to reduce the manufacturing cycle of large-scale stamping mold, CNC stamping and electroprocessing technology were promoted. Different kinds of cutting blanking methods have their disadvantages and are used in certain scopes in the industrial production. Cutting beams can be welded without further processing. For example, the speed of 2KW laser power in cutting carbon steel with 8mm thickness is 1.6m/min while in cutting stainless steel with 2mm thick is 3.5m/min, with tiny thermal influence area and tiny deformation. It greatly improves the working environment of the operator. Of course, in terms of precision and surface roughness of incisions, CO2 laser cutting cannot exceed electroprocessing. In terms of cutting thickness, it is difficult for CO2 laser cutting to reach the level of flame and plasma cutting. However, the above-mentioned advantages have fully proved that CO2 laser cutting has already replaced and are replacing some traditional cutting techniques, especially the cutting of various non-metallic materials. It is an advanced processing method which develops rapidly and is widely used. Since the 90s, as a result of the development of the socialist market economy in China, the competition between enterprises is very fierce. Each enterprise must wisely choose, according to their own conditions, certain advanced manufacturing technologies to improve product quality and production efficiency. Therefore, CO2 laser cutting technology has developed rapidly in China. The world’s first CO2 laser cutting machine was born in the 1970s. For over 30 years, due to the constant expansion of its application fields, CO2 laser cutting machine is improved continuously. At present, a lot of international and domestic companies are engaged in the production of various kinds of CO2 laser cutting machine to meet the market demand, such as 2-D plate cutting machine, 3-D spatial curve cutting machine, pipe cutting machine, etc. Foreign famous enterprises include German Trumpf, Italian Prima, Swiss Bystronic, Japanese Amada, MAZAK, NTC, Australian HG Laser Lab, etc. According to the Year 2000 Annual report statistics of “Industrial Laser Solution”-an authoritative magazine in American laser industry: in 1999, the total sales of Laser cutting system all over the world (mainly CO2 Laser cutting system) is 3325, totaling $1.174 billion. According to incomplete statistics, China currently produces nearly 100 CO2 laser cutting machines every year, totaling RMB150 million. Although the development of laser cutting is relatively fast, their application in China is relatively low compared with the developed countries. By 2003, in China, the CO2 laser cutting system used in industrial production has reached about 500, accounting for about 1.5% of that in the world. One type is large and medium-sized manufacturing enterprises. A large number of materials produced by these enterprises have to be blanking and cut, having strong economic and technical strength. The other type is processing station (known as Job Shop at abroad), which is specialized in undertaking laser processing business from others and has no its own dominant products. On the one hand, this kind of station can meet the needs of some small and medium-sized enterprises. On the other hand, it plays a role in promoting the application of laser cutting technology in the early stage. In 1999, there were 2,700 laser processing stations in the United States, of which 51% engaged in laser cutting. In the 1980s, laser processing stations in China were mainly engaged in laser heat treatment. After the 1990s, laser cutting and processing stations gradually increased. On this basis, as China’s reforms on large and medium-sized enterprise system deepen and China’s economic strength increases, more and more enterprises will adopt CO2 laser cutting technology. As for the cutting of three-dimensional spatial curve, it has been used in the automobile and aviation industries. Sheet metal parts which are not suitable for manufacturing from technical and economic perspectives, especially low carbon steel with complex contour shape, small batch and less than 12 mm thickness and stainless steel with less than 6 mm thick, to save the cost and time of mold manufacturing. Typical products suitable are: elevator components, elevator panels, machine tools and machinery casing, all kinds of electrical cabinets, switch cabinets, textile machinery parts, engineering machinery parts, large motor silicon steel sheet, etc. Stainless steel (general thickness <3mm) or non-metallic materials (general thickness <20mm)like images, logos, fonts, etc used in decoration, advertisement, service industries. For example, patterns of art photo albums, logos of companies, organizations, hotels and shopping malls, and the Chinese and English fonts at stations, docks and other public places. Special parts requiring even cutting. The most widely used typical part is the die-board used in the packaging and printing industries, which requires cutting a slot with a width of 0.7 to 0.8mm on the wooden template with 20mm thickness, then inserts the blade into the slot and cut off a variety of packing boxes with printed patterns. Use fashion on the die-cutting machine. In recent years, CO2 laser cutting is used in oil screening pipe to prevent sediment from entering into the pump and cutting off even beams with <0.3mm width on the alloy steel pipes having 6 to 9 mm in wall thickness. The perforation diameter should be over 0.3 mm and as it is difficult to realize this, many companies have been using CO2 laser cutting in their production. （1）3d laser cutting system or industrial robot is used to cut space curves and develop various 3d cutting software to accelerate the process from drawing to cutting parts. In order to improve the production efficiency, researchers are placed on developing various specialized cutting systems, material conveying system, linear motor drive system, etc. And the cutting speed of cutting system has exceeded 100m/min. （3）For extending its application in engineering machinery and shipbuilding industry, cutting thickness of low-carbon steel has been more than 30 mm, and much attention is being paid to nitrogen gas low-carbon steel cutting technology for improving the cutting quality of plate incision. Therefore, in China, it is still very important for engineering technicians to extend the application of CO2 laser cutting and some technical problems in practical application. 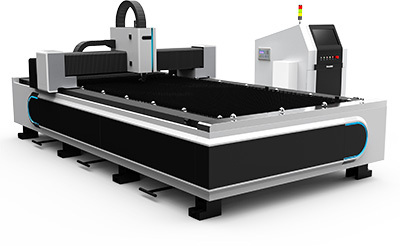 The parameters of the laser beam and the performance and precision of machine and CNC system directly affect the efficiency and quality of laser cutting. In particular, the following key technologies must be mastered and solved for parts with high cutting accuracy or larger thickness. One of the advantages of laser cutting is that the energy density of beams is high, generally >10W/cm2. As the energy density is indirectly proportional to 4/ PI d2, the focal spot diameter is as small as possible in order to produce a narrow slit. The focal spot diameter is also directly proportional to the focal depth of the lens. The smaller the focal depth, the smaller the focal spot diameter. However, the cutting has to spatter, and the lens is too close to the workpiece, easily causing damage to the lens. Therefore, generally high-power CO2 laser cutting adopts 5〃~7.5〃(127~190mm) focal length. The actual focal spot diameter is between 0.1 and 0.4mm. For high-quality cutting, the effective focal depth is also related to the lens diameter and the cut material. For example, when cutting carbon steel with 5 “s lens, and the focal depth is within +2% range of focal length, which is about 5mm. Therefore, controlling focus is very important to the position of the cut material surface. Considering the cutting quality, cutting speed and other factors,generally, for metal material <6mm, the focus is on the surface; for carbon steel >6mm, the focus is over the surface; for stainless steel >6mm, the focus is under the surface, and the specific size should be determined by experiment. （1）Print: Make the cutting head move from top to bottom, print the laser beam on the plastic plate, and the one with the minimum diameter is the focus. （3）Blue spark method: Remove the nozzle, blow the air, hit stainless steel plate with the pulse laser, make the cutting head move from top to bottom until the blue spark reaches its limit, which is also when the focus is located. For the cutting machine of flying light path, due to the divergence angle of laser beams, the distance between the near end and the distal end is different, and the beam size before focusing is different. The larger the diameter of the incident beam, the smaller that of the focal spot. （1）Parallel light pipe: This is a commonly used method, that is, adding a parallel light pipe at the output of the CO2 laser beam to expand beams, after which, the beam diameter increases, the divergence angle decreases, making the sizes of near end and distal end beams within the scope of cutting close to each other before the focusing. （2）The lower shaft of a separate moving lens is added to the cutting head, which is independent of the Z axis with the control nozzle to the material’s surface distance. When the workbench of machine tool moves or the light axis moves, the beam also moves simultaneously from the near end to the far end of the F axis, so that the beam’s focal spot diameter remains consistent throughout the processing area. （3）Control the water pressure of focus lens, which is usually a metallic reflection focusing system. When the focus beam size becomes smaller and the focal spot diameter becomes larger before focusing, the automatically controlled water pressure will change the focal curvature, making the focal spot diameter smaller. （4）A system which adds optical path compensation to the x – and y-direction of flight path cutting machine. That is, the optical compensation path is shortened when the cutting’s distal end optical distance is increased. On the other hand, the optical compensation path is increased when the cutting’s near end optical distance is decreased so as to keep the optical path distance consistent. Any kind of hot cutting technology, except a few cases starting from edges of boards, generally must drill a small hole on the board. 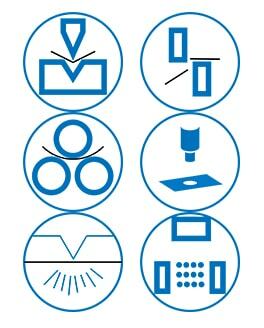 In the past, for Laser stamping machine, it first uses the punch to drill a hole, then uses the laser to cut from the hole. After continuous laser irradiation, the material will form a pit in the center, and then it was quickly removed by the oxygen flow coaxially with laser beams, forming a hole. Generally, the hole size is related to the plate thickness. The average diameter of blasting drilling is half of the plate’s thickness, so for thick plates, blasting drilling causes non-circular holes with a bigger diameter, not suitable to be used on parts with high requirements (like oil screening tube), but suitable for waste materials. In addition, as the oxygen pressure used in the drilling is the same as that of the cutting, which causes lots of splashes. Peak power pulse laser makes some materials melt or vaporize, commonly using oxygen or nitrogen as auxiliary gas to reduce the hole expansion caused by exothermic oxidation. The gas pressure is lower than the oxygen pressure at cutting. Each pulsed laser produces only small particles that are ejected in depth, so it takes a few seconds for thick plates to be drilled. Once the drilling is completed, the auxiliary gas is immediately replaced with oxygen for cutting. In this way, the drilled diameter is smaller, and the drilling quality is better than that of blasting drilling. Therefore, the laser used should not only have high output power, more importantly, high time and space characteristics of beams. This is why crossflow CO2 laser cannot meet the requirements of laser cutting. In addition, the pulse drilling should also have a reliable gas path control system to realize the control of gas type, gas pressure switching and drilling time. In the case of pulse drilling, the transition technology from the pulse drilling to the continuous cutting of workpiece should be emphasized in order to obtain high-quality incision. In theory, the cutting conditions of the accelerated segment can usually be changed: such as focal length, nozzle position, gas pressure, etc., but in fact, it is unlikely to change the above conditions due to the too short time. (3) changing pulse width and frequency simultaneously. The actual results show that the third method has the best effect. When the laser cuts steel, oxygen and focused laser beam are shot through the nozzle to the cutting materials to form a stream. The basic requirement for airflow is that the air flow into the incision should be large and the speed is high so that enough oxidation can make the incision material sufficiently exothermic. Therefore, in addition to the quality of laser beam and its controlling, the design of nozzle and the control of air flow (such as the nozzle pressure and the position of the workpiece in the flow) are also very important factors affecting cutting quality. At present, nozzles used in laser cutting are simple in structure, namely, a cone with a small hole at the top. Experiments and derivation methods are usually used for its design. Because the nozzle is generally made of copper, its volume is small, vulnerable, requiring replacement frequently, so it usually is not considered in fluid mechanics calculation and analysis. When in use, some gases with pressure Pn (Surface pressure Pg) will enter from nozzle side, calling nozzle pressure. Spraying out from the nozzle, reaching to the surface of the workpiece after a certain distance, these gases form cutting pressure Pc. At last, these gases expand to form atmosphere pressure Pa. The research indicates that with the increase of Pn, the airflow velocity increases and the Pc increases. For different gases, there are different pressure thresholds. When the nozzle pressure exceeds this value, the airflow is the normal oblique shock wave, and the gas velocity transitions from subsonic to supersonic. The threshold value is related to Pn, Pa ratio and degree of freedom (n) of gas molecules: for example, n=5 for oxygen and air, so its threshold Pn=1bar x (1.2)3.5=1.89bar. 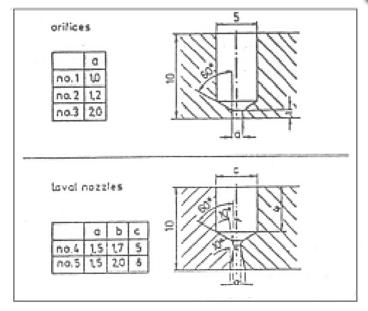 When the nozzle pressure is higher, namely, Pn/Pa = 1 + (1 + 1 / n) n / 2 (Pn > 4 bar), normal oblique shock wave of air flow changes into a normal shock, cutting pressure Pc dropping, air velocity reducing, vortex forming on workpiece surface, weakening the effect of air flow on removing molten material and affecting cutting speed. Therefore, when the nozzle featuring a cone with a small hole at the top is used, the nuzzle pressure of oxygen is often below 3bar. In order to further improve the laser cutting speed, a convergent-divergent nozzle, namely Laval nozzle, is designed according to the principle of aerodynamics, which can increase nozzle pressure without producing the normal shock wave. To facilitate manufacturing, the structure is shown in figure 4. The laser center of Hanover University in Germany has conducted experiments by matching 500WCO2 laser (focal length 2.5) with cone hole nuzzle and Laval nozzle respectively. The results of the experiment are shown as the figures which indicate the functional relationship between the surface roughness Rz and the cutting speed Vc of No.2, No.4, No.5 nozzle under different oxygen pressure. It can be seen from the figures that when Pn is 400Kpa (or 4bar), the cutting speed of No.2 hole nozzle can only reach 2.75m/min (carbon steel plate thickness:2mm). When Pn is 500Kpa or 600Kpa, the cutting speed of No.4 and No.5 Laval nozzle can reach 3.5m/min and 5.5m/min respectively. It should be pointed out that the cutting pressure Pc is the function of the distance between workpiece and nozzle. Because the oblique shock wave is reflected repeatedly at the boundary of airflow, the cutting pressure is changed periodically. The first high cutting pressure zone is adjacent to the outlet of the nozzle. The distance between the surface of the workpiece and the nozzle outlet is about 0.5~1.5mm, and the cutting pressure Pc is high and stable, which is a commonly used technological parameter in industrial production. The second high cutting pressure zone is about 3~3.5mm away from nozzle outlet, and the cutting pressure Pc is also high, which can also achieve the good effect, and is conducive to protecting the lens and improving its service life. Other high-cut pressure zones on curves are too far from the nozzle outlet to match the focused beam. In summary, CO2 laser cutting technology is becoming more and more widely used in China’s industrial production. At abroad, cutting technology and equipment of higher cutting speed and the thicker steel plate is being studied. In order to meet the higher and higher requirements in industrial production quality and production efficiency, we must pay attention to solve all kinds of key technologies and implement quality standards, which will make this new technology more widely applied in our country.